Even I get tired of cooking sometimes, especially January when the excess of December is still fresh in mind. That is why soup is a perfect excuse – Healthy eating disguising a bit of laziness! I like to add some interest and the ground cuimin adds a lovely flavour and topped with chives and crispy onions brings this recipe to delicious heights. Fully of the goodness of the squash and spices and perfect to bring to work. 1 stock cube made up to one pint. Stir to mix and coat the veg with the butter as it melts. Puree, taste for seasoning and serve with chopped chives and onions on top. 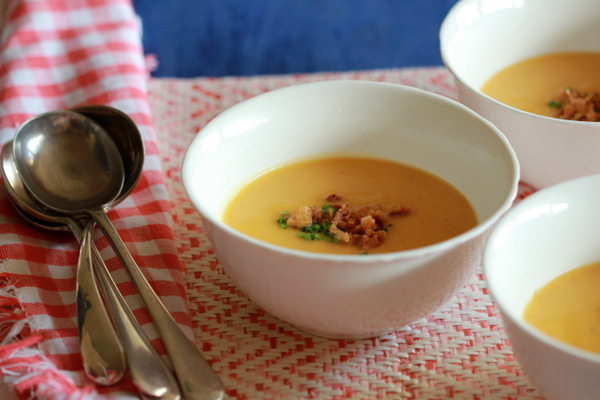 A lovely vibrant soup – delicious.